President Donald Trump plays the Ailsa course at his Trump Turnberry resort in South Ayrshire, July 14, 2018. The U.S. federal government billed taxpayers nearly $70,000 in expenses at the Trump hotel in Turnberry, Scotland, during President Donald Trump's visit last weekend, federal spending records show. The expenditures, totaling $69,767, were made by the State Department on behalf of the U.S. Secret Service, tasked to protect the president and his family members during their trips abroad. “The State Department frequently assists other U.S. agencies, including the Secret Service, with transportation arrangements and in making hotel bookings overseas," a State Department spokesperson told ABC News. The spokesperson added that the cost for those hotels rooms and additional transportation expenses are reimbursed by the Secret Service. The revelation of the expenditures at the Turnberry hotel comes on the heels of criticisms against Trump's touting of the hotel during a recent interview with British tabloid The Sun during his visit, calling the hotel a "magical" place. "These are taxpayer funds – money from you and I – that Trump is spending to enrich his own business enterprise," said Craig Holman, a government affairs lobbyist with watchdog group Public Citizen. "This constitutes self-dealing by Trump plain and simple, and we are paying for it." 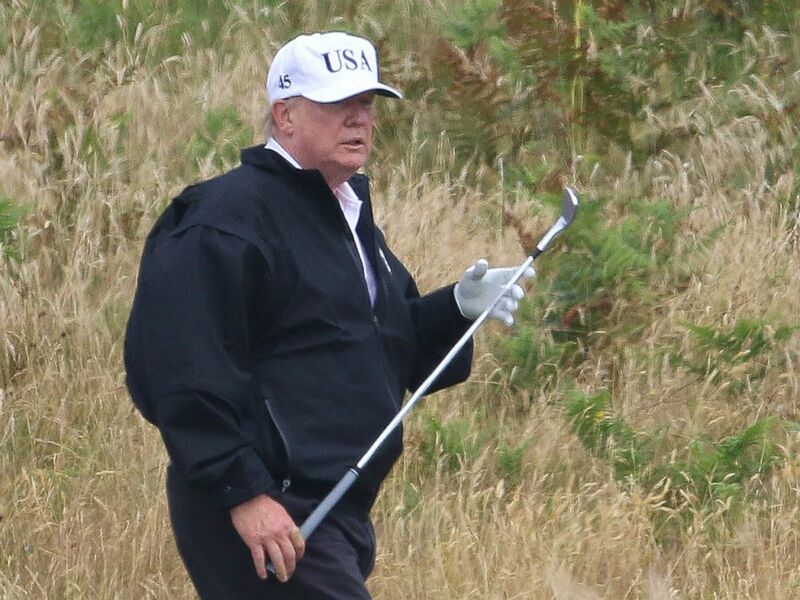 President Donald Trump plays golf at Turnberry golf club, Scotland, , July 14, 2018. It is unclear whether the Secret Service booked the Turnberry hotel rooms at a regular rate or received a discount. ABC News reached out to the Trump Organization for response. The recent Scotland expenditures, labeled "hotel rooms" for "VIP visit," are the latest U.S. Secret Service charges billed during Trump family members' visits to Trump properties abroad. The State Department spent more than $13,000 at just the Turnberry hotel between November 2016 through May 2017, according to additional spending records obtained by government watchdog group Property of the People and shared with ABC News. 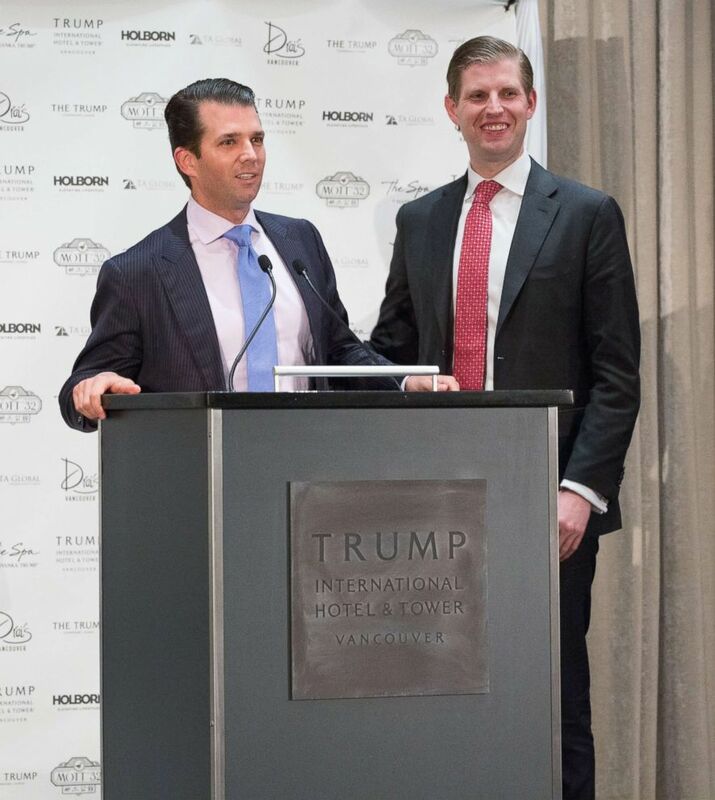 Donald Trump Jr. and Eric Trump attend the Trump International Hotel And Tower Vancouver Grand Opening on Feb. 28, 2017 in Vancouver. The documents also show that the State Department has spent at least $38,500 at the Trump hotel in Vancouver. This includes the roughly $15,000 spent to book rooms at the new Trump hotel for Secret Service agents protecting the Trump family members during its ribbon-cutting ceremony in late February 2017. The president and his son Eric Trump's visits to the Trump International Hotel in Doonbeg, Ireland, throughout 2017 cost the State Department nearly $28,000 at the hotel for Secret Service expenses.